In which Adam Smyth and James Kidd are joined by Polly Russell. 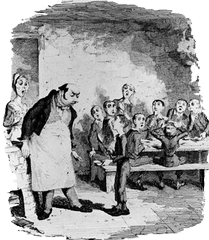 After the introduction to the work—or bill of fare to the feast—containing as much of the background as is necessary or proper to acquaint the listener (or ‘podder’) with in the beginning of this ‘podcast’—discussion turned to such topics as cookbooks—TV chefs—poems about plums—and the right number of servants for the upkeep of a stately house. Containing scenes of gastronomical felicity in different degrees of life—and various other transactions. Fit for all to consume. Polly Russell is a Curator at the British Library, and co-author of the celebrated The Kitchen Revolution: A Year of Time-and-money-saving Recipes. Polly is also a chef, and has cooked under Joyce Molyneux and at London’s renowned Moro. The pod you can eat between meals without runining your appetite.